During a deadly snowstorm, a bounty hunter (Kurt Russell) rushes to bring his fugitive (Jennifer Jason Leigh) to justice. But losing their lead on the blizzard, they must seek refuge at Minnie’s Haberdashery where the mysterious strangers inside may not be who they seem. 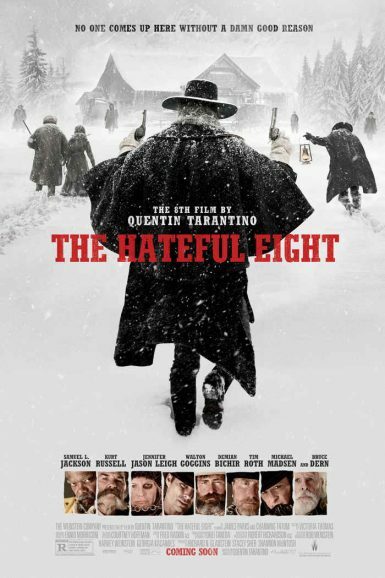 Written & directed by Quentin Tarantino and co-starring a stunning ensemble of QT favorites and pitch-perfect additions to his troupe: Samuel L. Jackson, Walton Goggins, Demián Bichir, Tim Roth, Michael Madsen and Bruce Dern round out The Hateful Eight. Quentin Tarantino joins Bret Easton Ellis’ popular podcast for a nearly two hour discussion on The Hateful Eight. Find out more in Tarantino’s Vault.